Thirty-two different writers will compete for $100,000 in prize money, awarded to those whose work “inspires compassion, hope and understanding in the human family.” The winners will be announced at the annual luncheon in February at the Four Seasons Hotel Los Angeles at Beverly Hills. Past winners of the Humanitas Prize include the writers of “12 Years a Slave,” “Silver Linings Playbook,” and “Precious.” Over $3 million has been distributed to these and more than 330 other writers since 1974. 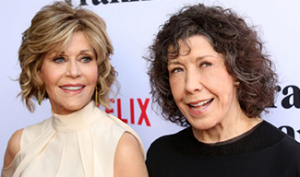 GRACE & FRANKIE “The Party” Written by: Alexa Junge is a finalist.